Édouard Glissant, long recognized in the French and francophone world as one of the greatest writers and thinkers of our times, is increasingly attracting attention from English-speaking readers. Born in Martinique in 1928, Glissant earned a doctorate from the Sorbonne. When he returned to his native land in the mid-sixties, his writing began to focus on the idea of a "relational poetics," which laid the groundwork for the "créolité" movement, fueled by the understanding that Caribbean culture and identity are the positive products of a complex and multiple set of local historical circumstances. Some of the metaphors of local identity Glissant favored--the hinterland (or lack of it), the maroon (or runaway slave), the creole language--proved lasting and influential. 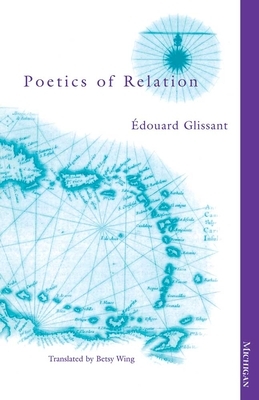 In Poetics of Relation, Glissant turns the concrete particulars of Caribbean reality into a complex, energetic vision of a world in transformation. He sees the Antilles as enduring suffering imposed by history, yet as a place whose unique interactions will one day produce an emerging global consensus. Arguing that the writer alone can tap the unconscious of a people and apprehend its multiform culture to provide forms of memory capable of transcending "nonhistory," Glissant defines his "poetics of relation"--both aesthetic and political--as a transformative mode of history, capable of enunciating and making concrete a French-Caribbean reality with a self-defined past and future. Glissant's notions of identity as constructed in relation and not in isolation are germane not only to discussions of Caribbean creolization but also to our understanding of U.S. multiculturalism. In Glissant's view, we come to see that relation in all its senses--telling, listening, connecting, and the parallel consciousness of self and surroundings--is the key to transforming mentalities and reshaping societies. This translation of Glissant's work preserves the resonating quality of his prose and makes the richness and ambiguities of his voice accessible to readers in English. Édouard Glissant is Distinguished Professor of French at City University of New York, Graduate Center. Betsy Wing's recent translations include Lucie Aubrac's Outwitting the Gestapo (with Konrad Bieber), Didier Eribon's Michel Foucault and Hélêne Cixous's The Book of Promethea. Édouard Glissant is Distinguished Professor of French at City University of New York, Graduate Center. Betsy Wing's recent translations include Lucie Aubrac's Outwitting the Gestapo (with Konrad Bieber), Didier Eribon's Michel Foucault and Hélêne Cixous's The Book of Promethea. "The most important theoretician from the Caribbean writing today. . . . He is central not only to the burgeoning field of Caribbean studies, but also to the newly flourishing literary scene in the French West Indies." "How rewarding to read a text in the last moments of this century that has absorbed quantum physics, jazz, modernist poetics, mathematics, and all for the sake of adding to the discourse of our planetary reality. " "Poetics of Relation is a must read. How rewarding to find a text in the last moments of this century that has absorbed quantum physics, jazz, modernist poetics, mathematics, and all for the sake of adding to the discourse of our planetary reality. . . . Beautifully, Glissant leaves behind the decrepit vocabulary of the sterile paradigm, and invents concepts logically parallel to those in other fields--like relations to relativity--in order to observe Caribbean and global communities in a fresh way. . . . Poetics of Relation seizes the reader who seeks to be challenged, whose openness will embrace the dichotomy between the 'Closed Place' and 'Open World.'" ". . . translation at its best: in this work the translator stands out as a very competent language and culture scholar, an erudite thinker, a sharp critic, and a very sensitive interpreter." "Betsy Wing has made a fine job of rendering the specificities of Glissant's poetic vocabulary. For this poet's prose, and French poet's prose, written in an idiom which is felt as so foreign to English that it can evoke reactions of exasperation and impatience. . . . Glissant's influence on the next, third, generation of francophone writers, and not just Martinican writers, can hardly be overstated."